The populair app Scanner Pro by Readdle has been named “App of the Week” and for the first time can be downloaded for free in the App Store. 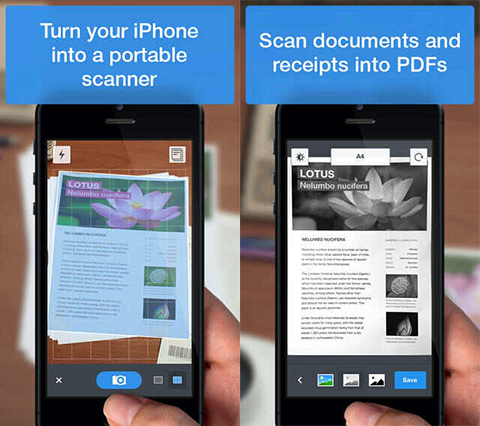 Scanner Pro transforms your iPhone and iPad into portable scanners. It allows you to scan receipts, whiteboards, paper notes, or any multipage document. The app removes shadows, sharpens scans, and corrects perspective in order to make scans as “readable as possible.” Typically the app costs $6.99 to download. Scanner Pro scans any type of document, ranging from a receipt to multipage documents. All scans are saved as a PDF. Automatic edge detection and advanced image processing help you to get great scans blazingly fast. You can also adjust the crop area manually, by tapping on the screen. While making a scan, borders are detected visually and in real time. Thus you can choose the best position to get a perfect scan and skip manual borders adjustments. All scanned document are produced as industry-standard PDF files. You can add new scans, delete or rearrange pages within a PDF file. Just scan any document and tap the “Send” button. If the document needs to be printed, send it to any printer nearby. It brings convenient access to all your documents on your iPhone or iPad. When you take a picture on your iPhone, seconds later it can be accessed on your iPad vice versa. You can download Scanner Pro by Readdle for free in the App Store here, for a limited time only.